Only a few months are left for the CBSE Class 10 Board Examination 2019. This period should be utilised for revisions and making a strong hold on the difficult subjects. Meanwhile, students must put extra emphasis on solving the previous years’ board question papers. It will help them to familiarise the trends of past, type of questions, level of difficulty and other aspects according to which they will be able to create the right plan and start preparing for the exam in a more efficient manner. Here we are presenting the analysis of last five years question papers of CBSE Class 10 Science. Students should understand this analysis to get acquainted with the changes in paper pattern, types of questions asked from different chapters and their weightage. All these will help them to prepare an effective strategy right from the beginning of the new academic session. Before year 2018, under the Continuous and Comprehensive Evaluation (CCE) pattern, class 10 students had to write two main examinations in an academic, Summative Assessment I and Summative Assessment II. In each examination students were tested on the basis of half of the course curriculum. In 2018, with the reintroduction of mandatory CBSE board exams, students wrote the annual board examination for which they had to prepare the full course curriculum for class 10 Science paper. The same examination scheme will be followed in the coming years as well. From year 2014 to 2018, the pattern followed in class 10 Science paper has almost been similar. Paper is divided into two sections, A and B. Section A contains descriptive type questions. These questions are based on various topics and concepts explained in different chapters. Questions are asked for 1 mark, 2 marks, 3 marks and 5 marks. Section B contains only the practical based questions. However, in past five years, the format of these questions undergone a few changes. Every year in class 10 Science paper, a value based questions is asked for 3 marks. While making an analysis of the last five years’ class 10 Science paper, one thing is clear that the difficulty level of the paper has never risen to the unexpected level or we can say that the paper was always easy. Almost all the questions asked in last 5 years were based on the topics and concepts given in class 10 Science NCERT book. Therefore, we suggest all the students to follow the NCERT books from the beginning of the session and read each topic thoroughly to get a strong hold on concepts and basics. This will definitely help you score optimum marks in the class 10 board exams 2018. Now we will make the class 10 science chapter wise analysis where we will get to know the number of questions asked from each chapter in past five years. We will also know the weightage each chapter carried in a year. First we will analyse the question papers designed from year 2014 to 2017, i.e., before the reintroduction of mandatory board exams in class 10. During these four years board examination was conducted for half of the course curriculum under the summative assessment II. 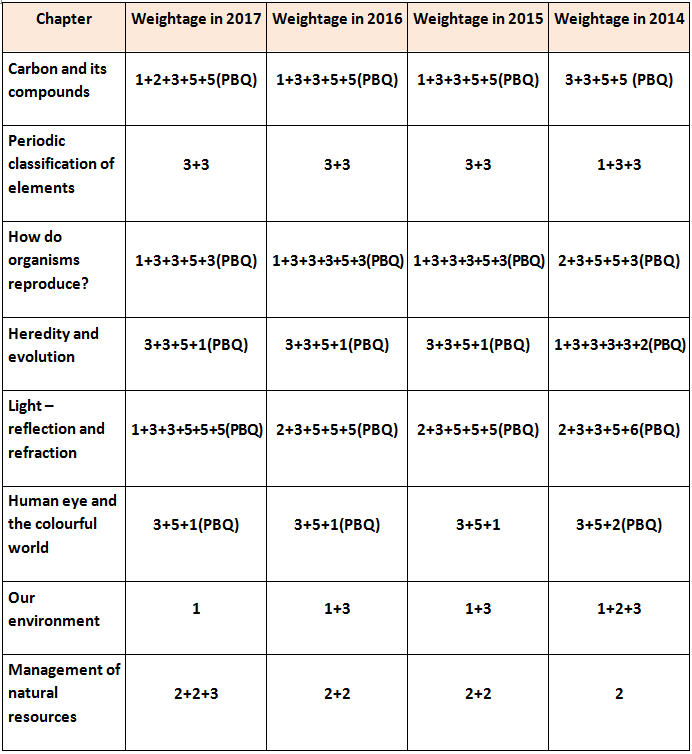 Let’s know the chapter wise analysis by going through the following table where number of 1 mark, 2 marks, 3 marks, 5 marks and practical based questions asked from each chapter of class 10 Science is indicated. From the above table you may know the number of questions along with their weightage, asked from each chapter in years 2014 to 2017. With the implementation of new assessment scheme in session 2017-2018, class 10 students wrote the class 10 Science paper for the complete syllabus. In 2014, there were 18 practical based questions, all being the Multiple Choice Questions (MCQs). Each question carried 1 mark. From year 2015 to 2017, total 12 practical based questions were asked in class 10 Science paper. Out of these 12 questions, 9 were MCQs carrying 1 mark each and remaining 3 questions were descriptive type with each carrying 2 marks. In year 2018, there were only 6 practical based questions in the Science paper. However all these were descriptive type questions with each carrying 2 marks. From 2015 to 2017, every year atleast three PSB questions were asked from the chapter- Carbon and its Compounds whereas in 2018 there was no question was asked from this chapter in section B. Every year, most of the practical based questions have been asked from the topics; Budding in yeast, reproduction in amoeba and image formation by spherical mirrors. Dear students, after going through this article you all would have familiarised the alterations made in the CBSE class 10 Science paper and got an idea of the chapter wise weightage. We hope that the class 10 Science paper analysis that carried by the experts at jagranjosh.com/cbse will help you to make an easy and effective preparation for the CBSE Class 10 Board Exams 2019. To read more such useful articles for the CBSE Board Exam preparation, click here.